Students and faculty were challenged to bring in reusable water bottles as part of “Ditch the Water Bottle,” to demonstrate their collective desire to reduce plastic use. The challenge was just one of the exhibits at the eighth annual Freshman Celebration. Photo by Victor Kamont. Freshman students expressed their concerns about the proliferation of garbage through exhibits that ranged from a trash can constructed with plastic water bottles to a necklace with beads made from junk mail to a city skyline composed of cardboard and trash. Written by Edward Humes, who served as the keynote speaker at this year’s Freshman Convocation, the book follows the journey that trash takes as it makes its way from garbage containers to landfills, sanitation plants, scrap heaps and the oceans of the world. Humes said the book does not provide all the answers, but he hopes it stimulates discussion around how people dispose of materials and encourages consumers to re-purpose and reuse trash. 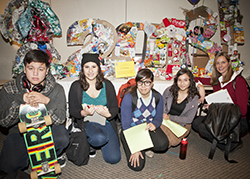 More than 1,000 students enrolled in University 100, a first-year freshman seminar dedicated to ensuring long-term academic success, participated in the Freshman Celebration on Dec. 4 and 5 in the University Student Union’s Northridge Center. The Academic First Year Experiences program pulls together various freshman-learning programs taught by faculty and staff from across a range of the university’s departments and divisions to enhance the experience of CSUN students. Students are encouraged to submit projects as part of the culmination of their work at the end of the semester, and prizes are given. Professor Catherine Givertz (fifth on the right) with students in her University 100 class. Her class won the event’s People’s Choice award for “Trash Fashion 2013.” Photo by Victor Kamont. Harut Gzlyan, an undecided major, said his class’ project, “Your Garbology: What Do You Throw Away?,” helped him better understand the importance of recycling. 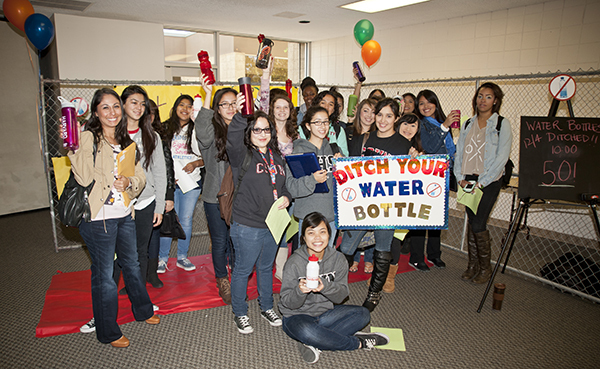 In addition to offering prizes for the projects, Debbi Mercado, a lecturer in the Department of English and University 100, organized a challenge for each class to bring in reusable water bottles as part of “Ditch the Water Bottle,” to demonstrate their collective desire to reduce plastic use. A total of 475 students and faculty brought in a their reusable containers, but Katie Christolear’s U-100 class was the winner with 100 percent participation, bringing in 27 bottles reusable containers. For more information about the Freshman Celebration, visit the Freshman Celebration website.